The key to fulfilling relationships, a satisfying work life, being authentic, confident and comfortable with yourself is simple, says Gail Saltz, MD. The stories we told ourselves as children to make sense of the world around us are the cause of most of our adult problems. 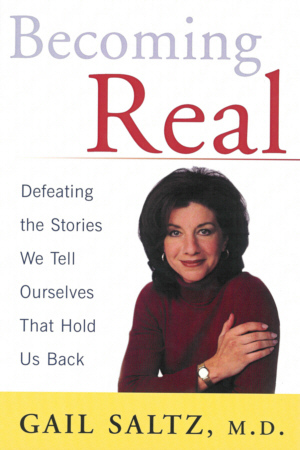 BECOMING REAL shows how to find those stories and rewrite them so that we can be free of the past, of repeating history, and start down the road of taking control, being stronger, and having the best relationships of our lives. Not many psychiatrists combine the imaginative insights of Gail Saltz with a TV personality and a flair for good writing. What’s more, Saltz dares to take us beyond the usual feel good quick-fixes -yes, through emotional pain! -but she rewards readers by demonstrating how to recognize the false stories we may have internalized about ourselves, and shows us how to rewrite them. An enormous contribution. — Jack D. Barchas, M.D. Gail Saltz, MD is assistant professor of psychiatry at Weill-Cornell School of Medicine. Dr. Saltz appears every other week on The Today Show and has a monthly column in Glamour Magazine. Dr. Saltz practices psychiatry in New York City.